It was my brother in law`s 60th birthday on 21/12/13 and a small gathering was planned for the evening. As a bonus Andy and I decided on a bike ride from Chester out to the Wirral and back mostly on traffic free routes. The forecast was not great with the possibility of high winds and rain by the end of the day. Overall the weather was OK with the occasional head wind but no rain. At the Burton Marshes there had clearly been a recent storm, but a lot if work had been carried out to clear the path. There were lots of bird watchers looking out onto the marsh and we found out later that some buff coloured pippit had been blown in on the wind. We carried on to Parkgate which had at one time been a holiday resort, but the foreshore was now marshland. On our way back we detoured to visit the RSPB centre at Burton and then found a well situated cafe on the bike route. 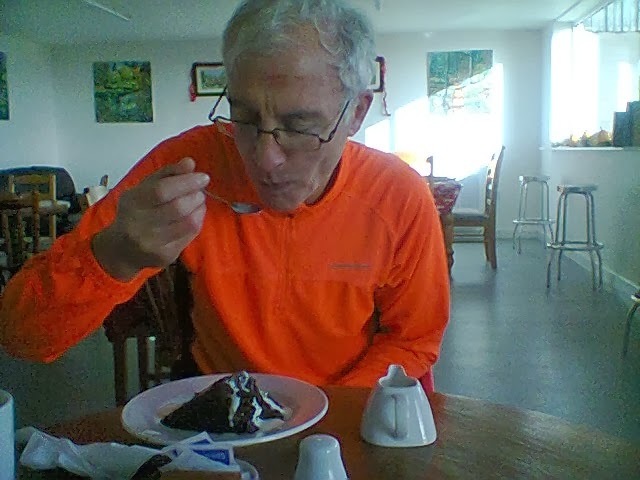 Here we had a huge piece of warm chocolate cake and cream washed down with a mug of coffee. There were numerous cyclists on the route, individuals and groups. The only hill was the incline over a bridge such a difference from where I live in West Wales. The lack of photos is down to my camera being left behind.